Earlier this month I attended the Alexa Conference and the concurrent Alexa World Fair. The events were organized by Score Publishing and VoiceFirst.FM and held in Chattanooga Tennessee, a town known as Gig City due to its early rollout of high-speed fiber optic internet. It was refreshing to go to a conference in a smaller, easy-to-navigate city where the internet worked perfectly. The conference covered voice technology in general and with a focus on Amazon Alexa. Panels and workshops in specific tracks covered voice in Health Care, Smart Homes, Consumer Marketing, and Storytelling, with a few individual sessions about in-car voice tech, banking, and voice for veterinarians. 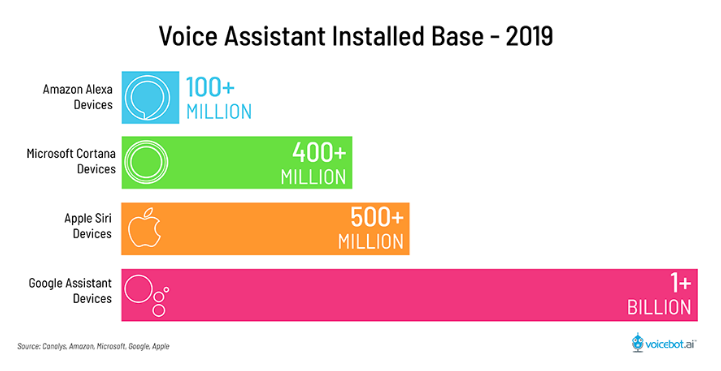 Amazon Alexa, Microsoft Cortana, Apple Siri and Google Assistant are all competing to become the consumer favorite for voice technology and artificial intelligence (AI) in the U.S. Google Assistant has the best search capabilities and is the platform most likely to actually understand what you say. Siri is the oldest in the group but still needs work. Microsoft is more interested in using its Cortana voice technology to work alongside other Microsoft tools and to partner with OEMs than in competing with other smart-speaker voice assistants. Microsoft has even partnered with Amazon to integrate Cortana with Alexa. In fact, at the Alexa Conference, Noelle LaCharite, Principal Program Manager, Developer Experience, at Microsoft demonstrated in a session how to use Microsoft AI and prebuilt machine-learning models to easily create more robust Alexa skills. Large Asian tech companies are also in the voice technology game but most don’t have a footprint in the U.S. An article in the Washington Post reports that top leaders at this year’s World Economic Forum in Davos discussed just how much U.S. companies are falling behind Chinese companies when it comes to AI, and that most U.S. executives probably don’t even realize it. Samsung’s Bixby is a relative newcomer to the voice assistant market and was only mentioned in passing at the conference since its smart speaker is yet to launch. Amazon is dedicated to voice technology, with an army of 10,000 workers assigned solely to Alexa. Amazon has strong AI and more than 70,000 Alexa skills (voice apps). The Alexa Skills Kit is available for developers who want to create Alexa skills. In 2018, Amazon also launched Blueprints, an easy-to-use interface that allows lay people to create their own Alexa skills for personal use on their own devices. No coding needed. 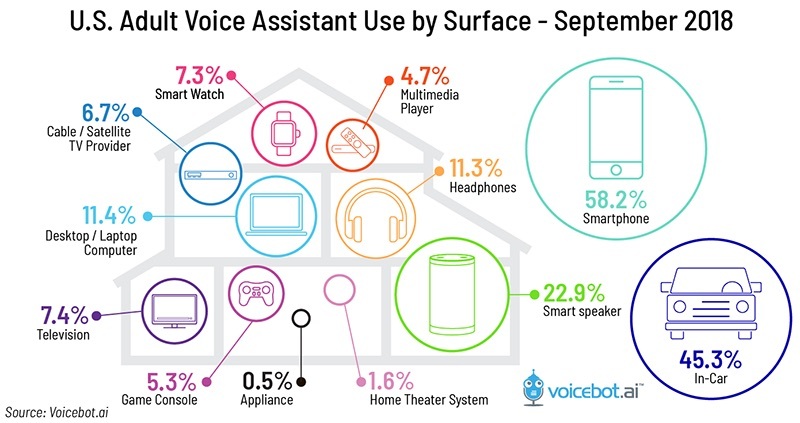 This year voice technology has blossomed across all industries. During the Alexa Conference, keynotes and sessions told an impressive statistical story about the current tipping point. Many attendees at the Alexa conference had recently returned from the Consumer Electronics Show (CES) in Las Vegas to report that virtually every device at CES this year was voice enabled by either Alexa or Google Assistant. In the Alexa Conference opening keynote, Brad Kinsella, Editor of Voicebot.ai, gave an overview of the voice technology market. Voicebot.ai is a news and review website that provides weekly newsletters, free market research reports, and statistics about the voice technology industry. The big picture is that voice is big, and it’s about to get much bigger. Voice is overflowing out of smartphones, smart speakers, desktops and in-car voice systems. We’re seeing voice in everything from microwaves to toilets to lawn umbrellas. Furthermore, innovators are finding impressive new ways to use voice technology aside from just pairing them with devices. When it comes to voice technology, the biggest opportunity to make an impact for the greater good is in health care. For example, Alexa can be used for simple medication reminders, for surgeons to get hands-free information, and for people with rheumatoid arthritis to manage their health and to navigate tech with their voice. Voice and other tech can actually help people remain independent longer as they age. As voice tech and the internet of things (IoT) merge, the elderly or people with disabilities can use their voices to give commands such as “close the window shades” and “turn up the air conditioner.” One conference panelist pointed out that this kind of tech frees up nursing staff to tend to more pressing needs with patients. We’ve been waiting for some life-changing innovative technology initiatives to hit health care for years, but due to the sensitive nature of the industry (health risks, privacy risks, legal risks, etc. ), it takes longer for this tech to come into fruition than in other industries. There have been some high hopes, some successes and some dead ends. One study aimed to record 10,000 voices in order to help detect Parkinson’s disease. Another, an Alphabet Verily research project, aimed to monitor people’s glucose levels with contact lenses, but failed. Still, the industry is ripe for disruption on all sides and it’s inspiring to see some movement in voice tech and AI that will actually improve people’s health, wellness and lives in general. There are still major privacy issues when it comes to voice tech in general, and specifically in health care. As one panelist pointed out: HIPAA was enacted in the U.S. in 1996 as a way to protect your personal health care data. Google was founded in 1998. The act is in dire need of an update that will protect people’s privacy and their health info in today’s higher tech world. Amazon is rumored to be working on making Alexa (or maybe a version of it) HIPAA-compliant this spring. Another health panelist at the Alexa Conference pointed out that our data is already mined and sold based on where we go online, what we do there, and even where we use our credit cards. The issue is not unique to voice technology. However, the personal nature of our voice data, the fact that it’s located in the intimate spaces of our own homes, and the sophistication of AI brings to light new issues that still need to be addressed on a policy level. In many cases the benefits of voice technology far outweigh the privacy risks. At this point, individuals can still decide for themselves if they want to dive into the world of voice technology. But very soon voice will be so ubiquitous that the major players will be deciding for you. More legislation is needed to ensure that our personal data is protected as more devices begin to listen in on our lives. The recent Alexa Conference had back-to-back, concurrent, interesting sessions about voice technology in health, storytelling, smarthomes and consumer marketing. I attended one day of health panel sessions, sat in on a couple of keynotes, and visited the Alexa World Fair expo where I learned about the work of these interesting companies below. SonicCloud is an interesting company that gives hearing assessments in order to define personalized hearing profiles that can then be used to help you hear better. These can be handy for the hearing impaired or for those who just want an excellent audio experience (music fans, gamers, people who work on the phone, etc.) The platform’s personalized hearing profiles work for streaming or for telephone. Seattle Children’s Hospital has an Alexa skill called Flu Doctor that lets users ask where local flu shots are offered and gives other information about influenza. Epson now has a voice printer that allows users to ask for a printout without touching the buttons. Imagine a nurse or surgeon asking for prescription printouts or post-op directions without having to touch germy printer buttons. Vohesu is a company that makes voice health assistants, starting with one that helps patients manage rheumatoid arthritis. Choose-your-own adventure stories have gone high tech. Several companies have created stories, creation tools, curated platforms and games that allow you to interact with story characters, choose directions in stories, and play games. Podcasting has exploded for an infinite range of subjects and there are new voice tech tools for gaming and for education. Founder of Atari and the Chuck E. Cheese chain, Nolan Bushnell has launched X2 Games along with co-founder Zai Ortiz. Bushnell and Ortiz gave a keynote at the conference about their upcoming St. Noire title, a mix of voice technology, board game, video and interactive storytelling to launch in March 2019. St. Noire is a mystery story created using voice actors and immersive sound design. The main experience is through voice interactions wherein participants can ask questions to characters such as witnesses and suspects. Bushnell said the script took about six months to develop and was more than 9,000 pages long due to the different paths the story could take. 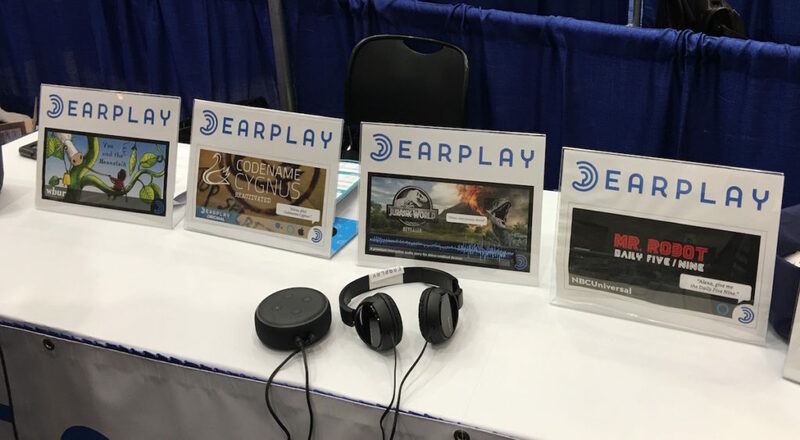 Earplay booth display at the 2019 Alexa Conference in Chattanooga. Earplay is a curated platform of interactive audio stories with gameplay features. From sci-fi to kids’ stories, they have an interesting selection. Say, “Alexa, start Earplay and play the demo” for a taste of what they have to offer. Tellables’ tagline is “Voice-Driven Conversational Stories for Talking Devices.” Try the company’s “My Box of Chocolates,” a selection of interactive mini stories labelled with assorted chocolate names, or “Tricky Teacher” — lessons about history, science and technology with a novel quiz process wherein users are asked to use critical thinking to identify which books would be most likely to have the correct answers. CastLingo from WitLingo allows individuals, institutions or companies to broadcast daily short 77-second audio announcements to Amazon Echo or Google Home. This product is being beta tested in schools and allows students to ask their at-home voice assistants: “What’s my homework tonight?” with customized answers from their own teachers. The Alexa World Fair included many companies that can help businesses dive into voice technology. You’ll notice below that many of these companies provide voice technology and AI as a service and also may have a product or two of their own that they’ve designed and put on the market. Voicify – A platform that helps brands plan and create voice experiences and automatically deploys them to Amazon Alexa, Google Assistant, Microsoft Cortana and more. ThickStat’s ConverSight.ai product allows people to interact with their computer systems with natural voice. Its software can be used for a range of industries from interactive voice directions for staff pulling inventory on the warehouse floor to voice-generated reports for sales. Audioburst is software that creates, tags, indexes and shares audio so that it is more easily searchable, and so providers can create customized experiences for users. AI-powered Audioburst has an API and is the company behind the NewsFeed skill on Amazon Alexa. Audioburst has partnerships with Bose and other music, information and content companies. SoundHound – This company has B2B AI services, voice search, and a robust music product. Its Houndify product promises to help you add voice AI to any product while maintaining your own brand. WitLingo provides B2B voice technology services to help companies develop Alexa skills, voice portals, drill skills and quizzes for learning. It is the creator of the CastLingo product. Botmock – Need to design a chatbot or conversational app? Botmock has created an easy click-and-drag prototype design tool for voice technology flow. It lets you design for multiple platforms at once. VoiceFirst Labs will walk brands through creating a voice strategy and help create a voice app or repurpose owned content. The Alexa Conference and Alexa World Fair included much more than is allowed in the space of this article. Go to the VoiceFirstFM site to read more about the Alexa Conference program and the Alexa World Fair exhibitors. Disclosure: Telp Media was given a free press pass to attend the Alexa Conference and Alexa World Fair expo. TELP Media is a full-service marketing and consulting company offering business development, public relations, content writing, and social media management for technology companies and publishers.